Sand, surf and sun! 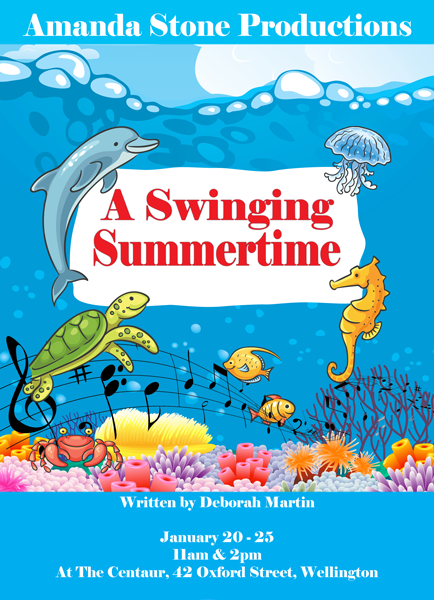 A Swinging Summertime is a show with a great environmental theme that takes a look at the beach environment, both on land and under the sea and how we affect this environment, both positively and negatively. The show features 12 fantastic songs that are performed by a number of different chorus groups like the neighbourhood kids, sea creatures and penguins. The cast consists of 9 lead roles and a number of different cameos but the show can support a wide range of cast sizes. From a small cast of 25 - 30 members all the way to a large cast of 70 - 80! Small bits of dialogue spoken by each chorus group allows for action to occur downstage while groups are moving on and off the stage but more importantly it allows for a large number of children to have speaking roles. The show takes place in three distinct settings: the beach, the penguins' spot and Neptuna's Kingdom. Only a simple seascape backdrop is needed for the show with various props being brought on for the beach scenes. The scenes at the penguins' spot can be performed in front of the curtain and the setting of Neptuna's Kingdom can easily be established by a creative use of lighting. It's summer and the neighbourhood kids are looking forward to some sun and surf. However, their fun is interrupted by a visit from the Beach Inspectors and to their dismay the kids learn that they will be banned from the beach because of their littering. It's going to be a terrible holiday. In order to try and educate them, the magical Fish takes some of the kids to Neptuna's ocean world where they see for themselves the damage that they have done to the sea. While there, angry penguins show them the way and Doctorpus is seen busily trying to treat all of the sick sea creatures. As it turns out Neptuna is in the middle of planning the sea's social event of the year but her party might have to be cancelled as the sea folk are all sick! The kids vow to change their attitude and return to the beach with plans to save the ocean environment. The show can be performed with a cast of 25 - 30 with children involved with the choruses playing dual roles in act one and act two and 11 other children filling the main roles. If you have a larger cast of 70 - 80 then there can be separate choruses for scenes in act one and act two. If even more roles are required then the size of choruses and the number of supporting singers for songs can be expanded. The other 11 roles are broken up into main and supporting roles. The main roles of Mick, Kate and Doctorpus are all suited for strong comedic actors and the role of Doctorpus also calls for the actor to be a strong singer. The role of Neptuna is a tough one and calls for an actor who can sing, dance and possesses good comedic timing. Fish is a sensible character that leads a dance number and also has portions of solo singing. In terms of supporting roles there is Shirl and Bert who work comically off of each other as well as sing. There are also a number of chorus groups which can vary in size including the beach inspectors, the penguins, beach kids and sea creatures.